The London punk rock band The Clash (for a moment band name The Weak Heartdrops was considered) owes its name - we think, based on the number of references to this statement - to one of the buzzwords of the seventies. 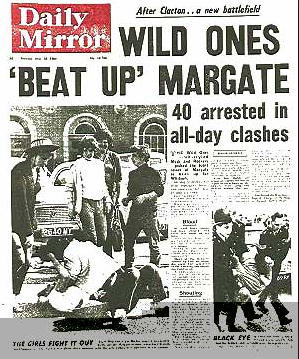 In British tabloids virtually every social quarrel was whipped up and brought to the attention by glaring headlines that not seldom mentioned a clash (between young people and the police, between parents and children, and so on). But other statements circulate on the internet as well. Such as that the band wore out reggae album Two Sevens Clash and found the inspiration for a band name in this album title. Another one is that the word Clash would have been sprayed as a graffiti on subway walls and that this piece gave the band a hint, but the viewpoint is indignantly dismissed by Clash-buffs: they do not budge an inch and maintain that members of The Clash made the graffiti themselves.